The San Mateo County Energy Watch (SMCEW) offers no-cost energy audits, technical assistance & installation support, and financial incentives for lighting and refrigeration projects to small and medium-sized businesses within the county. Certification as a San Mateo County Green Business provides local businesses with many benefits including technical assistance and resources to businesses working towards certification as well as promoting certified businesses. If you are interested in getting your business certified as a Green Business, check out the San Mateo County Green Business Program. 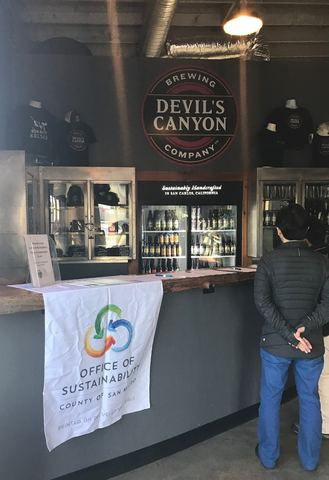 Check out how our case studies of New England Lobster Market & Eatery and Devil’s Canyon Brewery and how SMCEW supported in the Green Business certification process through our lighting upgrades program. If you are interested in finding certified green businesses throughout California, visit the California Green Business Network’s website. To help pay for energy efficiency upgrades to school facilities, PG&E offers 0% interest PG&E On Bill Financing. If you are interested in learning more please contact your PG&E representative or the SMCEW team. Interested in other ways to improve energy efficiency and lower costs at your business? Visit the PG&E Savings by Industry or Third-party Programs pages to learn about programs your business may be eligible for. Take a look at what these businesses have done to increase energy efficiency by working with San Mateo County Energy Watch. Support or become one of the businesses and cities in the peninsula that have opted up to Peninsula Clean Energy’s ECO100 and are now powered by 100% renewable energy!